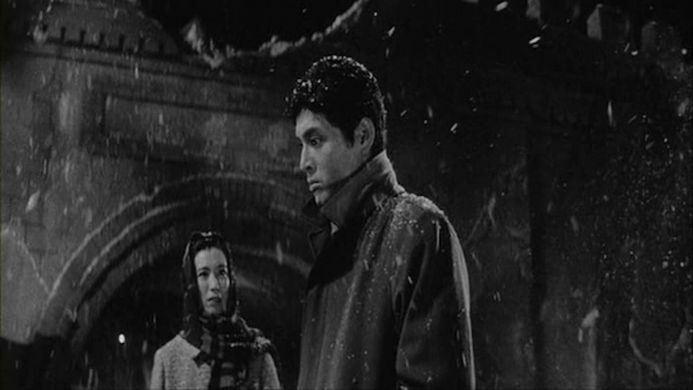 Masaki Kobayashi’s epic trilogy comes to a close with “A Soldier’s Prayer”. After wandering from the desecration of the battle field at the end of the previous film, Koji (Tatsuya Nakadai) finds himself along with two other soldiers making their slow painful return to Manchuria. Their steps are dogged by the advancing Soviet forces and they find that the villagers they meet are less than sympathetic. Though a few Japanese still cling to the idea that the war is not yet over, it is clear that they cannot survive. All Koji wants is to return home to Michiko, but first he must trudge through the horrors of their defeat. The film opens with a sequence that turns much of what has happened in previous films on its head. Koji is forced to kill a guard in order for them to escape detection by an enemy patrol. This leaves him with blood literally and figuratively on his hands and it is a decision that will later come back to haunt him. He can no longer separate himself from the atrocities of the war. The final film in Masaki Kobayashi’s epic “The Human Condition” trilogy is far from a triumphant send off. It shows the men of the Japanese Imperial army at their lowest ebb. The idealistic Koji of the first film is all but gone and he is left as no more than a shell. It is only his love for Michiko that keeps him putting one foot in front of another. Much of the plot also concerns the advancing Soviet troops. Koji, who has always sympathised with the communist cause, finds himself beaten and harassed as they are taken prisoner and put to work in Soviet camps. He maintains his staunch belief in doing good and strives to improve conditions, but just as in the first film he finds that power can corrupt and the leaders of the Russian forces prove no less cruel than the Japanese when they are in control. The film is packed with incident as the protagonists move from one catastrophe to another. It plays off many things that we have seen in the previous two films with references to what Koji has seen. There is also much more open philosophising in this film, with voice over narration explaining what is going through the characters mind. It is a time for reflection. Japan is soon to be crushed by American and Soviet Imperialism. It has reached the limits of its power and is about to suffer a precipitous fall. The acting is once again top notch with Tatsuya Nakadai’s performance a joy to behold. He undergoes a complete transformation throughout the trilogy, from naïve humanist to someone who is struggling to salvage the last scrap of his humanity. “A Soldier’s Prayer” is about the futility of war and the complete dehumanisation of individuals. It plays heavily on emphasising the importance of power in individual relations. Here we have a reversal of the first film with the Japanese soldiers captured and put to work for the Soviet cause. There is delusion amongst certain Japanese officers who still believe they should continue fighting, while Kaji is convinced that it is over. The most shocking thing about this film, and the trilogy as a whole, is that it shuns the heroic myths of war in favour of brutal realism. Kaji is not perfect, just trying to do his best in the worst possible situation. There is no victory for any side in this war. There certainly appears, in contrast with most trilogies, to be a definite downward spiral to events, with this seeing the characters and situation hit rock bottom. This makes for a powerful drama that is unlike anything else. This lengthy trilogy contains some outstanding sequences and acting. 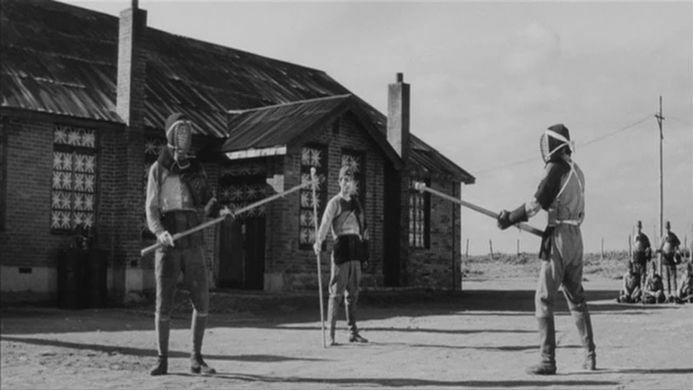 It also delves into the psychology of war and the absolute horror of it in a way that many films shy away from. A masterpiece of storytelling from start to finish with a potent message that remains relevant today.